DEGIRO has one of the lowest fees. It has a wide market coverage, providing access to the most important international and also to some local European exchanges. Its web and mobile trading platforms are well designed and easy to use. DEGIRO provides very limited research and no education. The forex trading is missing. Credit/debit card deposit and withdrawal are not possible. We compare DEGIRO fees with its peers, Interactive Brokers and Saxo Bank. DEGIRO's trading fees are one of the lowest at all asset classes. Because of this, it is recommended for frequent trading too. DEGIRO is Brokerchooser's fee champion for a reason: it is the lowest choice for US and most European stock trading. *DEGIRO provides a discount for your domestic stock market. For example, if you open an account from the UK, you can trade on the UK market for 0.0058%+ £1.75 instead of 0.058% + €4. It means that for UK clients, the UK stocks cost $2.7 instead of $5.7. For German clients, the German stocks cost $3.0 instead of $5.7. Such discount is applied for all local markets where DEGIRO is present. You also have one free ETF trade every month, which allows you to choose from a list of ETFs. The size of this trade doesn’t matter as long as it does not generate a short position. It is also free to trade the same ETF to the same direction in the same month if the trade is at least €/$1,000. At DEGIRO, the stock, ETF and CFD fees are the same. 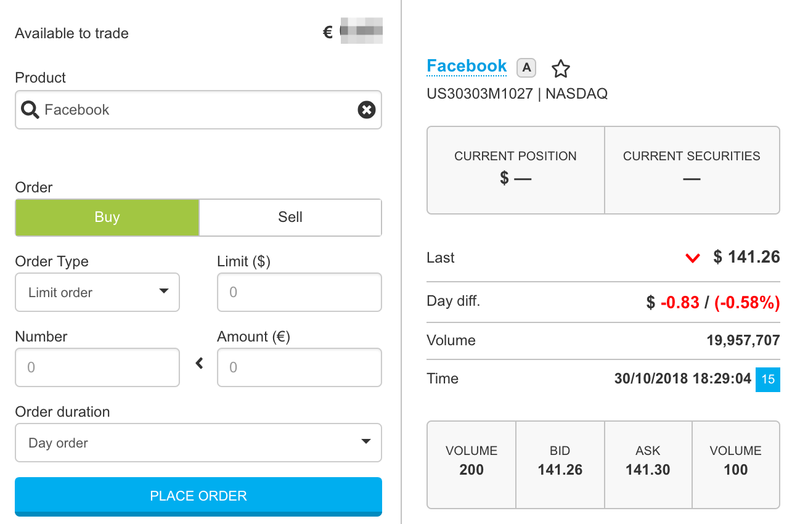 The trading fee is usually calculated as a percentage of the traded volume, except for the US and Canada, where you are charged based on the number of shares traded. The minimum trading fee for smaller and Asian markets are definitely high. DEGIRO's options fees are also among the best. For US and European stock index options, the fees are better than at Interactive Brokers. DEGIRO options fees are volume based, i.e. the number of contracts. At DEGIRO you can buy cryptos only through ETNs (exchange-traded notes). At the time of our DEGIRO review, you can trade with Bitcoin and Ether ETNs on the Stockholm Stock Exchange. DEGIRO's trading cost here is 0.058% + €4, but maximum €60. If you want to understand what is a crypto ETN check out our crypto blogpost. DEGIRO's financing rates are low, similarly to the trading rates. When you trade with leveraged products, like forex or CFDs, you are borrowing money from your broker. This has a borrowing cost, called the financing rate you pay for the broker every day based on the volume of your position. DEGIRO's non-trading fees are low. There is no account fee, inactivity fee, withdrawal fee, deposit fee, and custody fee. On the flip side, there is an unusual fee category, "setting up trade possibilities". This is an annual €2.5 for stocks. 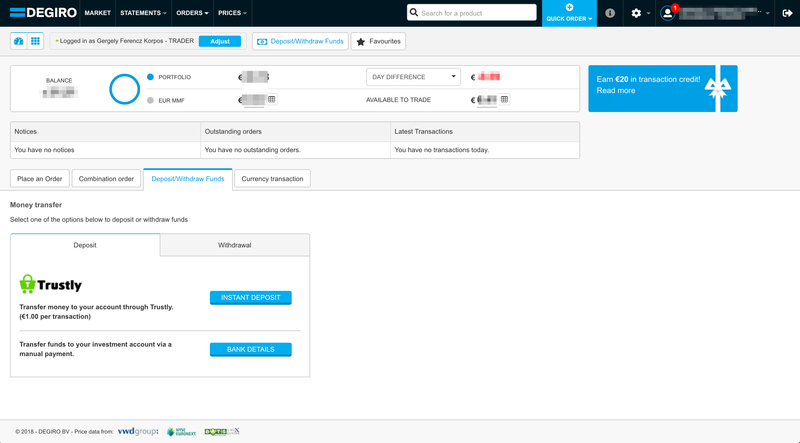 At automatically currency conversion, DEGIRO charges the 0.1% of the transaction value. At manual currency conversion, DEGIRO charges €10 and 0.02% of the amount. EU countries except for Bulgaria, Croatia, Cyprus, Estonia, Latvia, Lithuania, Luxembourg, Malta, Romania, Slovakia, and Slovenia. For a UK registration, you will need a mainland UK bank account in GBP. DEGIRO does not accept transfers from UK overseas territories or Crown dependencies such as Jersey, Guernsey, Gibraltar, or the Isle of Man. US clients are not accepted. At DEGIRO, primarily your bank account matters, not your residency. Still, you might be banned if you are not a resident of the above-listed countries. DEGIRO does not provide a clear guideline, so it is best to contact the customer service. There is no minimum deposit. This is great if you want to invest smaller amounts. From top to bottom you can access more products and features, and as such it gets riskier. The trading fees are the same for each profile. Some of the profiles may not be available in some countries. You can read more about DEGIRO profiles here. Tax: at the time of our review, DEGIRO does not provide tax-free account options like DEGIRO ISA or others that apply in other European countries. Two exceptions are Sweden where ISK is provided and the Netherlands where pension account is provided. Joint account: available, contact your local customer support. Account for minors: available, contact the local customer support. CFD trading: you can trade CFDs only on a separate account. It is not possible to mix the CFD trading with other assets within one account. Not the most convenient solution. The account opening is seamless, fast, and fully digital. Your account will be ready in 2-3 days. Complete an appropriateness test. By completing this you will be aware of the financial risks of trading. Agree to the conditions for real-time prices. Transfer money to your investment account. The base currency of your account is always the currency of your home country. This means for example that you will have a GBP account registering at www.degiro.co.uk as a UK citizen. You cannot have more base currencies for one account. However, you might be able to have a foreign currency account. Register on DEGIRO website at the country whose currency you want. Note, you will need to fund this via a same currency bank account. For example, if a Polish person opens an Irish DEGIRO EUR account, the DEGIRO base currency will be EUR, not Zloty. However, she can only fund the DEGIRO account via an EUR bank account. This is not working for all countries. So, before you start, contact DEGIRO's customer service. DEGIRO deposit fees are free of charge. You can fund via bank transfer, SOFORT or Trustly. SOFORT and Trustly are instant deposit service providers. On the flip side, the convenient and fast credit and debit cards are missing. The bank transfer usually takes 2-3 business days, while SOFORT and Trustly take around 30 minutes. DEGIRO has strict rules on bank transfer deposits. They only allow transfers from bank accounts in your name from accepted countries. DEGIRO withdrawal fees are free, as you would expect from our Fee Champion. You can withdraw only with a bank transfer, SOFORT and Trustly are not available. DEGIRO's withdrawal options are in line with its competitors. DEGIRO ensures that the withdrawn amount is transferred back to your bank account within 3 business days. We tested it and received the amount within one business day. DEGIRO's web platform will be available on your local language. For example, if your register from Germany your platform language will be German. 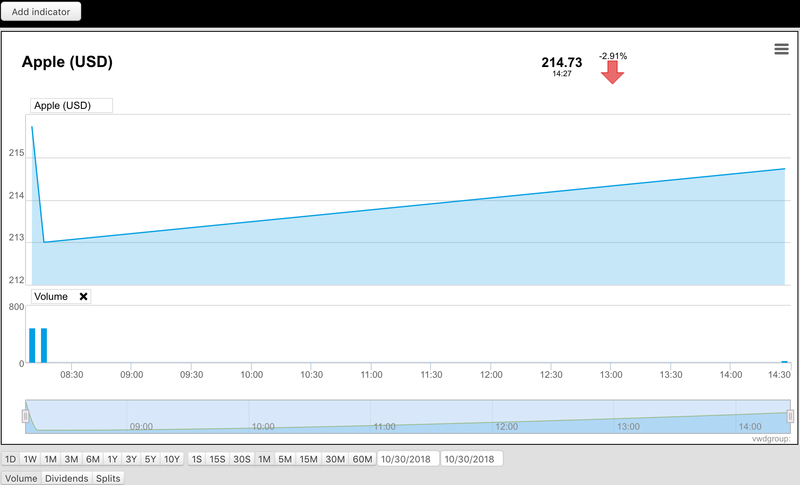 DEGIRO's web trading platform is great for execution, but not the most advanced. It is well designed and user-friendly, but lacks customization. You can choose between a one-step or two-step login. Two-step login is available through Google Authenticator. We recommend the latter as it is more secure. When you type the product name, a list of the products appear. They are separated by asset classes. Also, you can see in what stock market and currency the product is. You can select from several order types although not all of them are available for every tradable instrument. We encountered some questions and negative comments about DEGIRO’s execution policy, especially internal matching. DEGIRO no longer does any internal matching. We haven’t had any negative experiences with DEGIRO’s execution. After the execution, you can receive an order confirmation by email but text message notification is not available. The price alert function is also missing. The portfolio and fee reports are well organized. It is transparent what do you own and how much fees you paid for your transaction. DEGIRO's mobile platform has a basic but good design, it is pretty straightforward to use. The mobile platform is also available in your language. 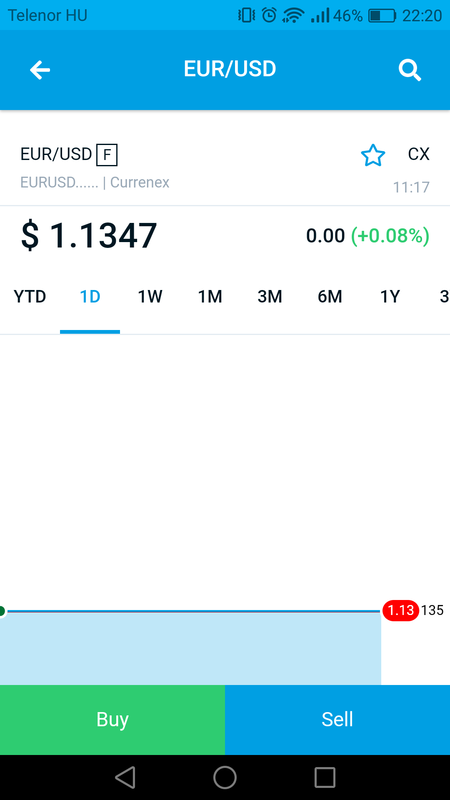 DEGIRO's mobile trading platform has a great and clear design and it is intuitive. The two-step authentication is included in the mobile app as well. The search function is the weakest link of the DEGIRO app. You cannot search by asset class and it is also not signed at the results section. 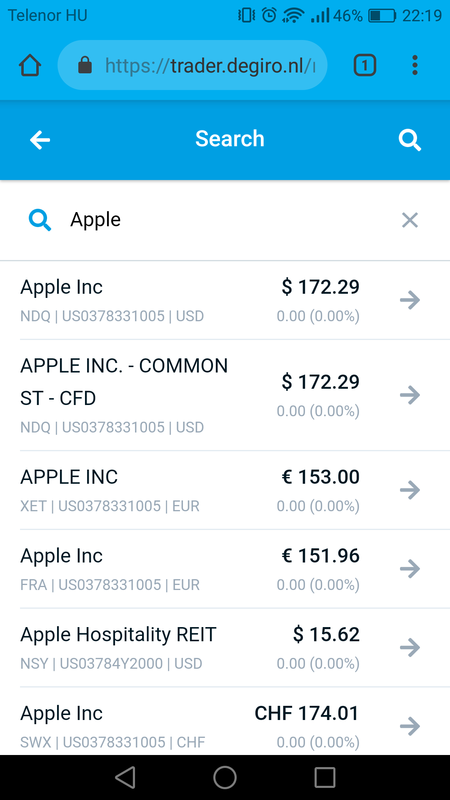 For example, if you type "Apple", you do not know whether you select an equity or an option. The order management is the same to the web platform. You can receive order confirmation messages in email, but price alerts are not provided. DEGIRO does not provide a desktop trading platform. DEGIRO has a good product portfolio. From stocks to CFDs, you will find everything except forex. At stocks, options, and futures DEGIRO is really competitive. The fund, bond, and CFD offers are average. 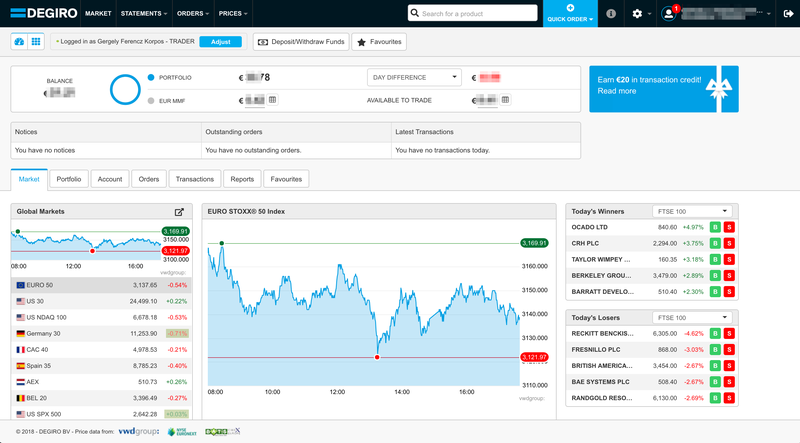 DEGIRO gives you access to 32 stock exchanges and more than 6,000 ETFs. It includes the largest international markets and also the smaller stock exchanges in Europe. You can trade with penny stocks as well. The stock and ETF offer floats between Interactive Brokers and Saxo Bank. DEGIRO's fund offer is narrow compared to Interactive Brokers's 196 fund providers. But, Saxo which doesn't provide any funds. You will find funds from the biggest names, like BlackRock or Vanguard. DEGIRO has an ok corporate and government bond offering, however it lags behind IB or Saxo Bank. You can trade on 13 option markets at DEGIRO. It is quite competitive, especially in comparison with Saxo. DEGIRO has a relatively narrow futures market coverage compared to Interactive Brokers and Saxo Bank. At DEGIRO you can trade only with stock CFDs. The number of stock CFDs are quite limited compared to IB and Saxo. DEGIRO's research is limited. There is a basic news feed and a simple charting tool. The charting tool is rather basic, but enough for an execution only trading platform. It is easy to use and comes with more than 20 technical indicators, but unfortunately, the charts cannot be saved. Both in the web and mobile platform you have a basic news panel with short, but informative market news. Customer support is average at DEGIRO. You can reach out to them in many languages and there is a great telephone support. On the other hand, there is no live chat and 24/7 availability. Phone and email support are available, but live chat is missing. A big advantage is you can contact the customer service in your language if you are from one of the 18 supported countries. DEGIRO's customer support was ok. The phone support's response time was fast and we got relevant answers. The email support is mediocre. Once we got an answer within a day, another time we didn't get an answer at all. We missed the chat function and the 24/7 availability. Education and demo account is not provided. DEGIRO is a licensed investment firm regulated by Dutch Central Bank and Netherlands Financial Markets authorities. On the flip side, the information you can access about the company is limited. DEGIRO is a Dutch broker established in 2008 serving mostly European clients. Is DEGIRO safe? To be certain, it is best to check two things: how you are protected if something goes south and what the background of the broker is. All countries €20,000 Dutch Central Bank (DNB) and The Netherlands Financial Markets Authority (AFM) DEGIRO B.V.
DEGIRO is regulated by the Dutch Central Bank (DNB) and The Netherlands Financial Markets Authority (AFM). Regulators of other countries - where DEGIRO offers its services - are also notified by DEGIRO and aware of its operation. For example, in the UK, DEGIRO is registered with the Financial Conduct Authority (FCA). 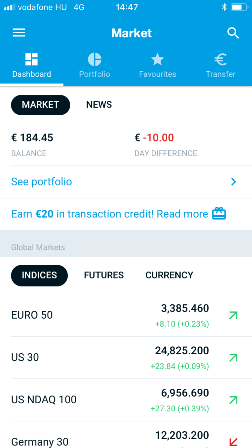 When you open an account with DEGIRO you get a €20,000 investor protection. A negative balance protection is also provided for CFDs. DEGIRO is a Dutch private company established in 2008. It has a 10 years track record. The longer the track record, the better. Longer track record means the company was able to manage financially tough time periods, like the financial crisis. You may have some troubles if you are looking for more information about the company. The amount of financial information is quite limited compared to other brokers. It is not transparent who are the owners of the company. This is important because a strong parent company might supply DEGIRO with additional capital if needed. Most of the products, like stocks or ETFs you can trade with DEGIRO are exchange-traded. Therefore you do not run a counterparty risk with DEGIRO. This is good news. If DEGIRO defaults your assets still will be safe.